I have a nice size horseshoe layout, Lionel 3 rail tin plate with a 110 watt ac transformer, 2 turnouts and, I am currently running a Lionel GP38 with rail sound, pulling boxcars only. I am planning on buying a couple of MTH GP38-2, to put on the turnouts so my question is can I run 2 engines on the main line, at the same time, with one transformer with out hurting any of the function's. I suspect that the transformer power would be marginal for your needs but more importantly the MTH and the Lionel will not sync speeds so you will have to be agile at how you run these engines and turn one out before the second one catches up with it. If I have understood your question correctly ! Your transformer may be taxed to its limit but yes, you can run two trains on one track, conventionally, without hurting anything (unless you run one into the other). I do it sometimes. It has been the subject of some previous threads including one that got pretty technical. But conceptually, there is no problem. its more fun, of course, with two separate tracks, but . . .
would stall out and the other would speed up wildly and crash into it. To me, without dcs or tmcc, it is absolutely hair raising. Although I can isolate one train, when I try to cross over to the same line as the other train, something always goes awry, so I quit trying. Change is constant, and the only constant is change. You could divide the layout into isolated blocks and use relays to allow independent control of 2 trains on the same loop. As long as each train is in a seperate block. I am sure some of the more experienced conventional operators will share more details. Another fine product of the Cleveland Public School system. A nice site to visit is J&C Studios. For decades b/4 any command, we would run two trains the same track in either the same way or opposite directions. For the same direction simply provide several isolated blocks with a S.P.S.T. toggle switch and just kill the power to the faster engine when it got too close to the slower engine. For conventional 3 rail set the engines for forward only. To run in the opposite directions you need at least one passing sidding. Just park one train and let the other one go out the same switch the previous running engine came in. Dallee Electeronics sells gizmos that will run this automaticly with conventional engines. I built an 0n30 display layout with two independent loops, each with one passing tracking. We set four entry level conventionl Bachman trains on the layout, Two trains on each loop running in opposite directions. The switch controls and siding blocks were all Dallee automated. The trains ran all day unattended without incident. If you think you can, you will. If you think you can not, you never will. I like the block idea but mostly to drive one off the track while the other one goes on. Just wanted to make sure I'm not hurting anything. I have two sets of track, one inside and one out, going in the opposite direction. always love it when they go by, blowing the horns and they look like there going to run into each other but they don't. I do it all the time with a passing siding. I just made sure I got one loco into neutral when the other is in drive (or reverse). I hesitated when this thread first appeared, but will offer this quirky idea for what it is worth. I often run two trains on one loop without blocks or sidings - but there are a couple of "strings attached" to how I do it. Allan Miller and others commented in a previous thread about this method that I'm not really "running" my trains since in doing this "trick" I have very limited independent control of either train. That is true. On the other hand I have two trains sharing the same track, often for hours at a time, without colliding: depends what you want to do. 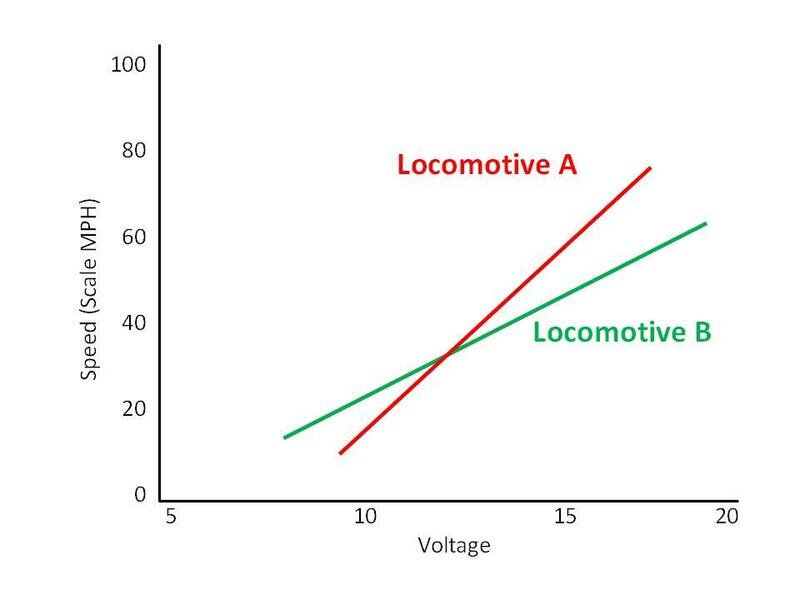 The basic idea is illustrated in the diagram below which shows the voltage versus scale-speed "curves" for two hypothetical locomotives. 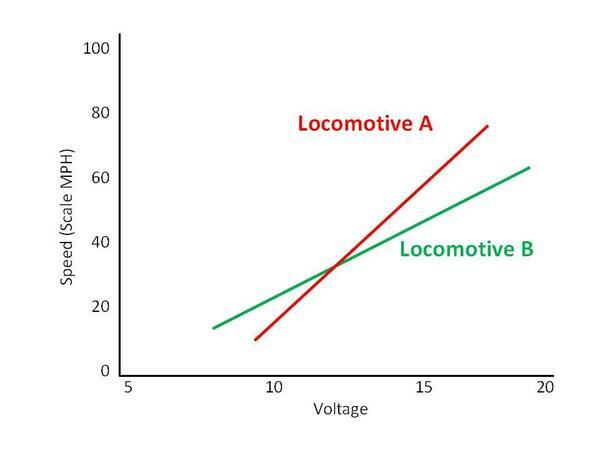 Locomotives A and B have been chosen so they have very different voltage-versus-speed curves that cross one another. If put on opposite sides of a loop, and run at twelve volts - the voltage where the red and green lines cross, they will run together and neither will ever catch the other. Drop voltage slightly - say to 11 volts, and loco B will begin to slowly catch up with loco A. Raise it to 13 volts and loco A will begin to catch up with loco B. You can set up your locos on opposite sides of the loop, set them running and adjust throttle up and down around the 12 volt point until they are spaced well, then leave it at that precise point and just let them run at that one magic speed. This works for me largely because I have a long loop (141 feet) on which I run two relatively much shorter trains (loco+tender+6 cars+caboose) each maybe ten feet long, for about 60 feet between each train and the one in front. Usually, I can only get the speed dialed in about right, so one gradually catches the other, but I keep watch and adjust ever 30-45 minutes or so, they never touch. This really does work well after a little practice and I do it often but only on my longest loop. It means that I run four trains routinely rather than just three, which makes my train room all that more fun. If you want to do this "trick," usually locos from different companies work best together. My favorite pairing is an RK PS1 Y6B with either a Lionel 0-4-0 or Legacy Southern Crescent. The Y6B has a wildly different voltage-speed curve compared to the other two, so either piaring works well. TMCC is what I do but before that I just fiddled around trying to get one in neutral while I get some spacing the getting the other in neutral to put the one in the yard. Could you provide the MTH catalog number of said locomotive please? I'd love to get my hands on one.